By now, it can’t have escaped your notice that big changes are afoot in the ways schools measure and report progress. The “old” levels system is “out”. For many years, it underpinned the way in which teachers recorded and measured the capabilities of their cohort; as well as provided a way to compare individual and group performance. This system and the national curriculum are changing… radically. One perceived benefit, so far, is that schools will be more free to develop their own curriculum – to respond to the particular needs of their pupils, and to ensure a broad and balanced education. The problem then comes in how do schools report on this? Combine that with the fact that not every school has been in a position to redefine its curriculum – or even wanted to. Rachael Marshman, product manager for SIMS Assessment has told me that developments she and her team have been working on will “…help support schools to assess however they choose…”. A bold and powerful statement of intent! You may remember the early indicators from Summer last year. She went on to explain that SIMS Assessment Manager will provide “…a comprehensive attainment and progress tracking solution, linked directly to the National Curriculum Programmes of Study [and] if you would prefer to work towards your own formative tracking system, you can still use the flexible features of SIMS Assessment to customise it to match your requirements…”. The great news is that you don’t need to wait until the forthcoming Spring Update in order to benefit from this work. A number of resources are available now, to allow you to track the progress of early years and the primary phase. 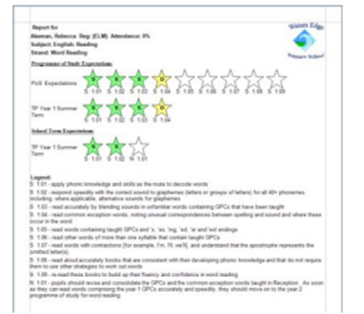 Rachael explained that enhanced Key Stage 1 and 2 progress tracking templates; including tracking grids and aspect analysis for the core reading, writing and maths skills are already there. This gives a great insight into what is coming. It’s important that this is somehow related to the new national curriculum – this is covered too. Last year, we found that there would be a mapping tool, allowing schools to link their chosen assessment method to the aspects provided by Capita. In Spring, this goes one stage further – schools will have access to a brand new Programme of Study area within SIMS Assessment. According to Rachael, this is “… where teachers can review and assess against the entire National Curriculum Programmes of Study for every subject across KS1 and KS2…”. The main advantage of this new functionality is that teachers can easily record both their regular formative assessment and the more traditional termly (or half termly) summative judgements against specific statements of the National Curriculum all in one place. The focus is on teacher workload, in a similar way as it was in the SIMS Teacher app. The idea is to put to tools within reach of the user, without over complicating the process – or keeping them from making a difference, by teaching. It also won’t restrict them from teaching the way they choose and will allow them to easily assess against the curriculum they’re teaching. Schools will be able to clearly identify what their pupils know, and don’t yet know, in relation to the school defined Programmes of Study. Below is a screenshot of the new Tracking Marksheets that enable schools to review progress in both sublevels and points. These Marksheets also display prior attainment, allow for the recording of targets and calculate progress from previous summer and key stage. Colour conditional formatting has been included to instantly highlight those pupils who have made no progress or expected, good and rapid progress. The layout and functionality of the SIMS Assessment Manager screens has been overhauled…long overdue some commentators have said. Now, rather than having to build separate analysis tools formulas or methods for understanding the data (such as exporting to Excel or partner products) – new onscreen analysis clearly indicates a pupil’s progress towards National Curriculum end of year or Key Stage expectations. Of course, exporting to Excel is still possible however. Feedback is instant, enabling a teacher to clearly see and understand the progress of their class. This is vital considering the current Ofsted focus that all levels of staff within a setting are responsible for a child’s progress; and all should understand their current state and their goals. To help with this, there is also functionality to indicate which knowledge or skill statements are the focus for teaching this term. Reporting on (both in the short and long term) progress towards these school specific expectations is therefore possible. This brings the benefit of school analysis based on curriculum and subject strands / areas actually being taught. There is also no need to jump between marksheets to review prior attainment as any achievement recorded for pupils historically will automatically be presented on screen and identified by a ‘slice’ of colour. If the historical assessment is still relevant there is no need to re-enter data as the assessment will still count towards overall analysis. Achievements recorded within the current assessment period are clearly shown by a bold block of colour as shown. Once the ‘school expectations’ have been defined for the term they can be locked so that they do not change during the chosen assessment period. Only an ‘assessment operator’ or ‘assessment coordinator’ has the permissions to Lock Targets to preserve the ‘school expectations’. This can be locked and unlocked at any time, and appropriate warning messages are shown to the user. 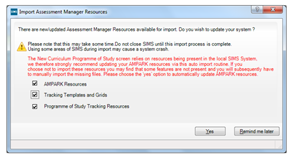 Before accessing the new Programmes of Study Screen schools will need to make sure that their AMPARK resources have been imported successfully after upgrade. Thankfully, this has been thought about – and the first time they go into SIMS Assessment Manager they will see the following. For the Spring release the ‘no’ option has been disabled to avoid schools inadvertently bypassing this opportunity to update their assessment resources. The spring update also includes easy access to individual pupil reports to review attainment and progress towards end of year or school expectations. The new reports are very visual, the example below, taken from a beta version, is using coloured stars. This enables parents to more easily understand what can become quite a confusing area. Many will have noticed that at present, much of these new capabilities are only really applicable to KS 1 and 2. Rachael told me that work “…on the KS3 requirements for assessing without levels the scope of which is falling into [the] summer and autumn development cycle this year…” is underway. Sadly, this will mean that Schools and teachers will have to wait until the end of the second phase of this release to get the full functionality. This does raise the question of what exactly will be possible in September, when the new curriculums are put in place by Secondary Schools. As a result, Rachael and her team are trying to be completely transparent by stating “… we will be communicating exactly which functionality will become available in each release as it is confirmed…”. Feedback from test schools, and alike must have been driving development further – because even as this post was being written, more information about future updates have been coming out. It is by no coincidence that this article is being released just as the Spring update is available. It gave the best possible clarity of what was in, what wasn’t, and what was coming next. What I can say directly is that both formative and summarise assessment reports are a priority for the summer release, to help schools summarise their attainment and progress analysis for cohorts, key groups and individuals. That is a point which you will notice has been reiterated over and over… freedom for a school to assess and report on a child’s progress – no matter what assessment system is used. SIMS Assessment Manager will complement and inform, not direct. 1. Progress Grids show teachers whether each student is emerging, developing, secure or has mastered a skill in a simple traffic light display. This allows schools to spot if a child is progressing or not, no matter what assessment system they follow. 2. SIMS Discover presents a clear and complete analysis of your school information and instantly alerts you to changes to a pupil’s performance, attendance or behaviour so you can act quickly to get them back on track. 3. 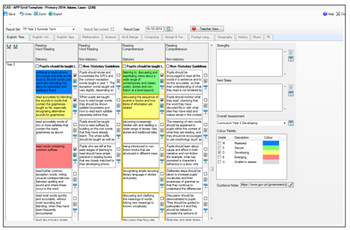 SIMS Assessment Manager can be used with your own resources. To support this, the new mapping tool helps maps your data to pre-defined resources such as Marksheets, Tracking Grids, Analysis and Discover graphs. It will also help drive assessment in the one-click school report. This entry was posted in Capita and tagged Apps, Assessment, Capita, Catherine Lane, Data by Stuart. Bookmark the permalink.